Since moving to Colorado over the summer, I have seen several types of new-to-me evergreen trees. As we approach the holidays, I like to focus on the pine/fir/spruce trees we see, because they (obviously) stay green all winter and are fun to study. Lots of people decorate their homes with Christmas trees during the holiday season. I recently read the legend of St. Boniface for the first time, which contains the story of the very first Christmas tree. I’m looking forward to reading this lovely book, Kristoph and the First Christmas Tree, with my children during the Advent season. St. Boniface, a German Christian monk, lived from 680–754 A.D. The tradition came from Germany, and the first Christmas tree in the United States is documented in the Moravian town of Bethlehem in Pennsylvania, in 1747. It was a tree made of wooden platforms, though, a bit like the one you see in the picture below. 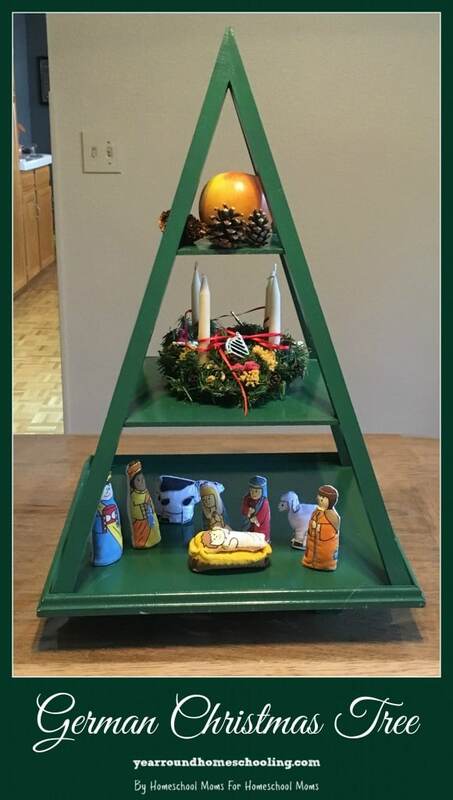 My family and I were part of a Moravian church in North Carolina, and I was able to get our lovely German tree at their Candle Tea. Christmas trees didn’t gain the tremendous popularity we see today, however, until 1848 when Queen Victoria encouraged her husband, Prince Albert, to decorate a tree as he had done during his childhood. Thanks to the general population’s desire to imitate royalty, the custom spread rapidly in England and in the United States. The first Christmas tree in the White House was either in the 1850’s, during Franklin Pierce’s administration, or in the late 1880’s, during Benjamin Harrison’s administration. There’s a little controversy over that (isn’t there always?). In this country alone, between 25 and 30 million real Christmas trees are sold each year. Isn’t that amazing? 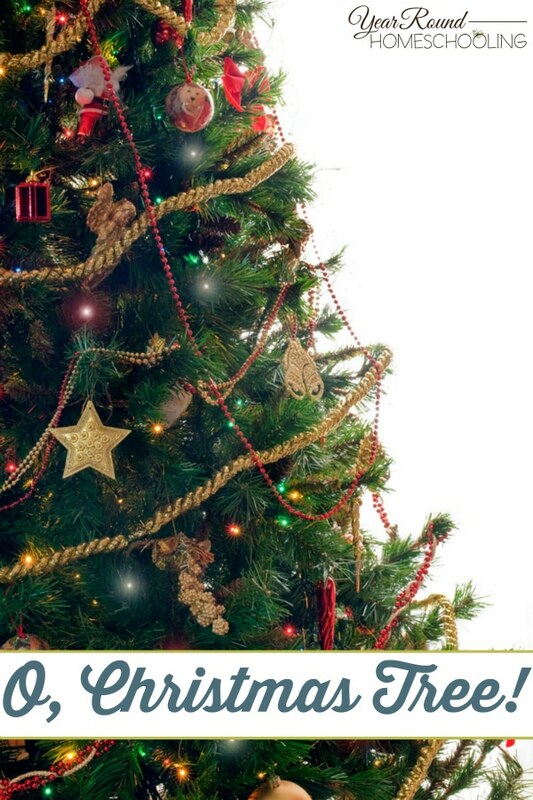 Did you know that most Christmas trees are NOT pine, but fir or spruce? Here is a list of common species of evergreens used for Christmas trees. When I was growing up, we had spruce trees, which have short, sharp needles. In fact, I don’t have a real tree in my home, because I remember all too well trying to hang ornaments and getting pricked fingers, not to mention the needles in the carpet we stepped on for months afterward! I do love the smell of a fresh Christmas tree, though. Another great thing about the holiday season is all the great things people share to do – science activities, crafts, recipes, etc. Here are some fun Christmas-tree related things I’ve found to put a bit of holiday spirit into your homeschool. Conifer Nature Study – Over at my blog, Acorn Hill Academy, I’ve put together a study of the different kinds of conifer trees. I have a copywork freebie for you – please come on over! Tree Lapbook – free from Homeschool Share, this lapbook includes information on both pine trees and oak trees. Start with pine trees now, and watch for oak trees to come to life in the spring. Includes a nice book list with books you should be able to find at your local library. 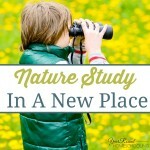 Pine Cone Experiment – As I mentioned last month, we have a plethora of pine cones at our house! We can’t see to stop collecting them. Try this nifty experiment and record your results. Pine Cone Weather Station – I hadn’t heard of this one before! Learn how to predict the weather with pine cones! Pine Cone Bird Feeders – I have to share one more plug for feeding the birds. This is the time of year when birds flock to feeders, because food is more difficult for them to find in the wild. You’ll get the best variety now, and in the spring before the seeds really start coming on. Conifer Recipes and Pine Recipes – I’m sharing under science, because in our house, they would DEFINITELY qualify as an experiment! Collaborative Pine Tree Art Project – This is a preschool art post, but I think older kids would have fun with this, too. Use your pine cones and boughs to make a lovely piece of artwork. Paper Plate Laced Christmas Tree Craft – Another fun idea for little folks. Over at Acorn Hill Academy, in addition to my conifer nature study post, I have a lovely copywork freebie for you if you’d like to come over and check it out. I’d also like to invite you to visit my friend Jennifer’s fabulous site, Advent Idea Box, for lots of great information and ideas for the holiday season. I wish you and your family a very blessed Christmas! 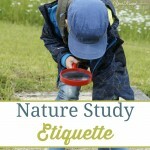 Nature Study: Time To Feed The Birds! I'm a Charlotte Mason homeschooler, passionate about educating with her principles, and working on starting a library of living books to share with other homeschoolers. I am the author of Acorn Hill Academy and you can find me on Facebook, Twitter, G+, Pinterest and Instagram. interesting where you went to church in NC. we are moving to Moravian falls NC. we will go to The gathering, morningstar church tho. We camp at the falls every summer looking at land. till the time the Lord brings us into the mission He has for us down there. hope you are enjoying the beauty of the west now. It’s so beautiful here! It’s different, for sure, but so much new to explore. I hope you enjoy North Carolina! It’s a beautiful state. Wonderful post! I was thinking of starting an evergreen tree study for the next couple of weeks. This is perfect! Woo hoo! I’m so excited you’re going to do an evergreen study! I’d love to hear what species you find in your area! Thanks so much for sharing the history behind Christmas trees. I always find traditions and their origins so fascinating. A book I used in my homeschool years ago was Mrs. Sharp’s Traditions – Reviving Victorian Family Celebrations of Comfort & Joy. It was such a treat to visit here today! Even though my homeschooling days are long since gone since my children are adults, I love being reminded of that very special time in our lives. Karen, thank you for the title of that book! It sounds lovely and I’m going to look for a copy. I enjoyed learning about the history of the Christmas tree myself.